While only 5% of Monument Valley installs on Android were paid for, Ustwo Games isn't sweating the pirates. Ustwo Games, developer of puzzle title Monument Valley, was doing some number crunching when it observed the vast majority of installs for its game went unpaid. Only 5% of Android installs of Monument Valley were paid for. Producer Dan Gray explained this was merely an observation rather than a complaint, but he also noted not all 95% of the remaining installs were pirated versions. Some people paid for the game and then legitimately installed it on their multiple Android devices, such as on a phone and on a tablet. Gray told Re/code he has no idea the exact number of installs that are legitimate, but he said a small portion of the 95% is made up of people installing the game on multiple devices. 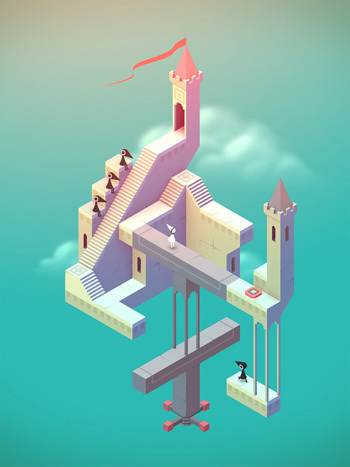 Gray noted Ustwo Games did not include the day Monument Valley was available for free on Amazon in its figures. Interestingly, 60% of iOS installs of Monument Valley were not paid for; while it's still not a great figure, it's less shocking than 95% of unpaid installs on Android. Even so, that figure isn't unheard of for Android games. In 2013 developer Lucky Frame's Gentlemen! found 144 of 50,030 people had paid for the game on Android. Lucky Frame director Yann Seznec discovered most of the illegitimate copies went to people in Russia and China. In 2012 Mad Finger Games switched its game Dead Trigger to a "freemium" model from its one dollar price point because piracy hurt the games' sales so much that advertising brought in more money than legitimate installs. Mobile app piracy has become so influential that the US Department of Justice convicted two people in March 2014 for committing copyright infringement at a popular Android app piracy website. This looks grim. Gray doesn't focus on the negativity too much, though. "The best way I like to think about it is, the majority of those users probably wouldn't have bought the game anyway," Gray told Re/code. "So it's not like we're losing revenue. And, of course, I'm sure some of those users have recommended the game to friends who maybe aren't as tech-savvy as they are. It's essentially free marketing. When I say we're not complaining about that ratio, that kind of ratio was expected before we made the game and it's not that surprising now that we've released the game. You just roll with the punches."